After watching the film Burlesque I've been researching into the make-up looks of the burlesque/vintage pin-up style. 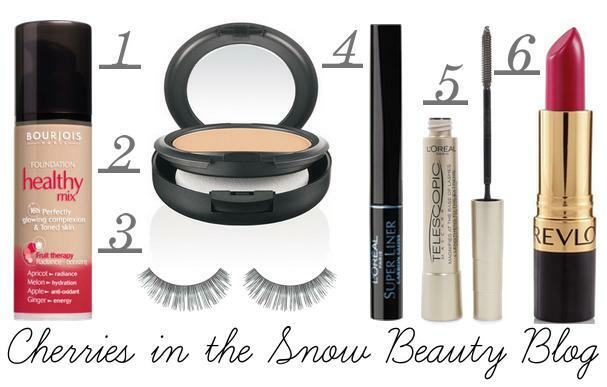 I adore Dita von Teese so I thought I'd recommend a few items to recreate the look. 1. I recently purchased the Bourjois Healthy Mix foundation, I've had so many compliments saying my skin looked flawless, so I think it's perfect to recreate the Dita look. 2. To add an extra bit of coverage and set the foundation I use MAC's Studio Fix Powder with a fluffy powder brush, patting the colour into the skin. 3. I've always been a fan of Eylure lashes in 101, sadly they've changed the packaging, but I've stocked up on the old versions. Pin-up girls love long fluttery lashes. 4. L'Oreal Super Liner in Carbon Gloss is a beauty blogging favourite, I've never found an eyeliner so pigmented and long lasting as this one. Perfect for the winged eyeliner look Dita always sports. 5. I've recently mentioned that the L'Oreal Telescopic mascara was my new favourite, I use this to bind the false lashes to my own so they look neater. 6. The infamous Cherries in the Snow by Revlon, it's my favourite lipstick if you can't tell by my blog name! It's an ideal shade for the luscious red lips that pin-ups are famous for. Do you like the pin-up look?